Arbor launched their brand in 1995, they started as a snowboard company and added skateboards a few years later. 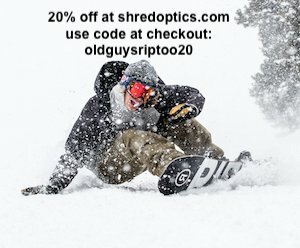 They’ve stayed true to their roots, making high quality, handmade, environmentally friendly snowboards. 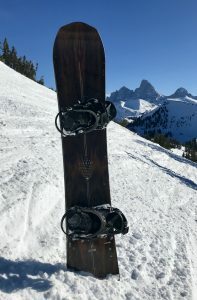 The Arbor Element was one of the first production models in their ever-evolving lineup and is still one of their top sellers. 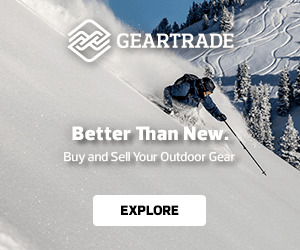 The Element is an All-Mountain twin with Arbor’s Rocker System and grip tech. The profile on the Element is the ‘parabolic’ rocker, which gives the board less bend in the nose and tail. Arbor has put out some pretty unique shapes the last few years and the Element’s Knucklehead tips give the board a distinctive look and enhanced float in powder. 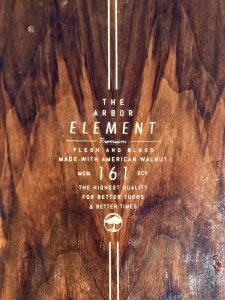 The Element also features Arbor’s Double Barrel core, which is two bamboo struts that run tip-to-tail down the center of the poplar core. Arbor used bamboo to add power and strength for bigger mountain performance. The Element is rated as a medium flex. 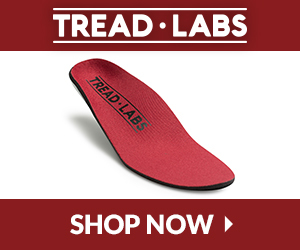 The bottom of the board uses a sintered base material for durable, fast ride. The top sheet is a gorgeous black walnut wood grain with mixed glassing for added durability and flex. 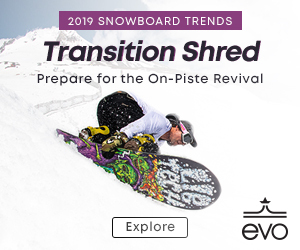 Lastly, the Element features Arbor’s 360-rail technology, a fully wrapped sidewall that eliminates the need for tip fill and ties everything together with added durability. 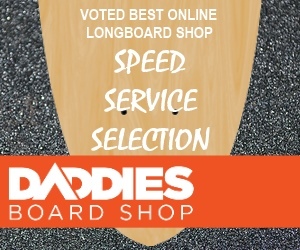 The Arbor Element was very fast, extremely responsive edge to edge and the grip tech gave the board some extra control when ripping high speed carves. It performed well on rails. Jumps, and butters thanks to the Rocker System profile. This deck is super playful and fun on the groomers and riding switch is very comfortable. It was a bit stiff for my personal preference in a park board but handled everything well. 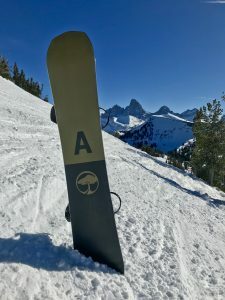 The Arbor Element is a terrific intermediate to an advanced board for all mountain riding. It’s been a staple in Arbors line up of boards with an attention-grabbing Black Walnut top sheet. The Element is loaded with technology for ripping all conditions; it would make a great addition to any quiver.